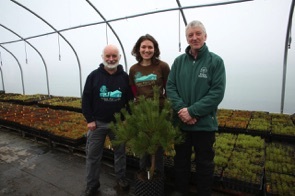 An acclaimed forest restoration project near Loch Ness is demonstrating how conservation can create employment opportunities in the Highlands, says award-winning charity Trees for Life. This week Trees for Life introduced two new seasonal staff roles at its Dundreggan Conservation Estate in Glenmoriston, bringing the number of employees at the biodiversity hotspot to six – a substantial increase on the single employee under the site’s previous ownership, when it was managed as a traditional sporting estate. With concerns about employment in much of the country, and across the Highlands in particular, Trees for Life says that the steady growth in employees at Dundreggan since its 2008 purchase of the estate –combined with high job satisfaction levels – shows how conservation action can be good for jobs. “People benefitting from a wild, natural environment is part of our vision for a restored Caledonian Forest. Dundreggan shows that breathing new life into native woodlands and other natural habitats can offer fulfilling employment and meaningful training opportunities,” said Alan Watson Featherstone, Trees for Life’s Executive Director. Alongside the new jobs, hundreds of volunteers from diverse backgrounds – including the unemployed and those with limited access to healthy outdoor activities or training opportunities – are now gaining the chance to develop environmental skills, knowledge and accredited training each year. With most practical work at Dundreggan carried out by volunteers, one of the new posts created by Trees for Life is a Long-term Volunteer Coordinator. In this role, former volunteer Tony Henry will help people to gain hands-on conservation experience, through Trees for Life’s Long-Term Volunteer Programme. In the role of Seasonal Nursery Assistant, Emma Beckinsale will help run Dundreggan’s Native Tree Nursery. Here Trees for Life grows more than 30,000 locally sourced native trees each year, and is trialling innovative ways to propagate rare and hard-to-grow species such as aspen and montane willows. The establishment of the new roles has been made possible thanks to funders including the Scottish Power Foundation, which is supporting the Long-Term Volunteers Programme in 2015. Since being purchased by Trees for Life, the 10,000-acre estate has been transformed into the charity’s flagship rewilding project. Home to a wealth of rare and endangered species – including 10 never recorded in the UK before – Dundreggan has been described as a Highlands “lost world”. The expanse of wild land contains substantial areas of ancient woodlands, including remnants of the original Caledonian Forest and Scotland’s largest area of dwarf birch. It is home to a group of wild boar in a fenced enclosure as part of a native forest regeneration project, and also hosts groundbreaking scientific research projects. Dundreggan’s previous role as a sporting estate has left much of it in poor ecological condition however, and restoration of its woodlands and habitats requires long-term conservation action and sustained funding.